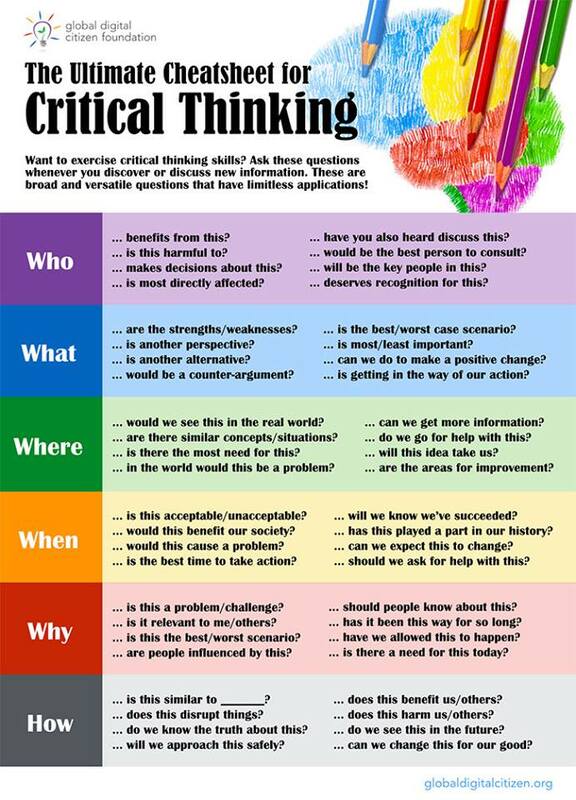 Critical thinking is an imperative in an active, functioning democracy. If the people are not informed, and able to sift through the bias, innuendo, false statements and fallacies of logic, they are easily swayed and manipulated by persuasive rhetoric. Critical thinking skills are not taught in public schools; even in lower level college course, it is not a required course. It is up to each individual to begin learning what it means to be a critical thinker. The image below is a cheat sheet and can help you ask appropriate questions to uncover enough information to make an informed conclusion from which an intelligent decision can be made.